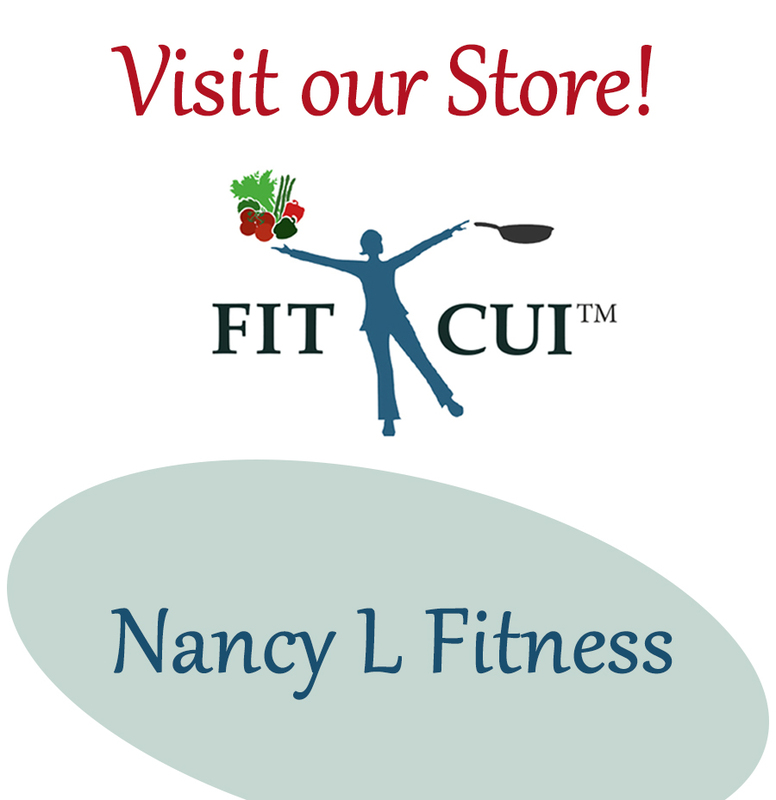 July 25, 2015 July 10, 2016 Nancy L.
Eccentric exercise/training is a form of exercise that works well for the elderly, and also for people with cardiopulmonary or neurological issues. It challenges the muscles; increases muscle strength; protects the joints; and uses a lesser amount of energy. Eccentric training targets the muscle lengthening (elongation) phase of a muscle contraction by purposely slowing this portion of the contraction, resisting the force of gravity. concentric contraction: muscle contracts (shortens) as the weight is being lifted. isometric contraction: stopping movement (at 45 or 90 degrees). eccentric contraction: occurs while lowering the weight; the muscle lengthens. When controlling the rate of the downward motion of the dumbbell (resisting the force of gravity), the muscle is in a state of eccentric contraction. It can be difficult for some senior citizens and those with certain afflictions to participate in a much needed rigorous exercise program, mostly due to loss of muscle mass. can raise resting metabolic rate. Stand close to a chair. Slowly lower yourself into the seat of the chair (seated position). To increase difficulty, stop midway before completely lowering into the seated position. When strong enough, progress to barely touching the chair. 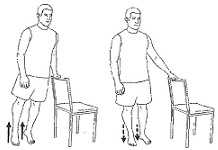 Holding onto a support (such as a chair), raise up onto your toes. Now slowly lower your heels to the floor, taking 3-5 seconds to do so. 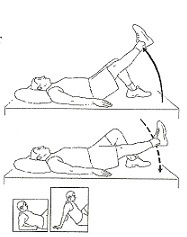 Keeping your knee/leg straight, lift your right leg. Slowly lower your leg, taking 3-5 seconds to do so. 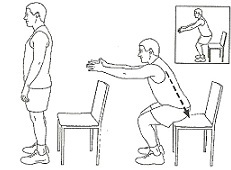 To decrease difficulty or to reduce back strain, sit up to perform the exercise (as shown in the small boxes). 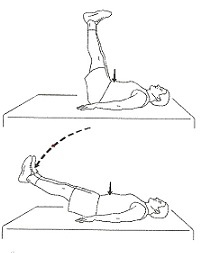 Lie on your back and lift legs straight up. Be sure to pull your belly button in toward your spine for stabilization and do not arch your back. Slowly lower your legs, taking 3-5 seconds to do so. To decrease difficulty or reduce back strain, bend your knees while lowering legs. Begin in position with elbow bent. Extend right arm straight out behind, quickly. Slowly bend your elbow back to starting position, taking 3-5 seconds to do so. To increase difficulty add weight using a dumbbell or other household item in your hand(s). Standing with elbows bent, lift both arms to shoulder height. Do not hunch or hike shoulders during the exercise. 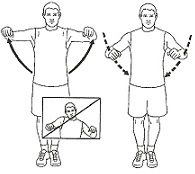 Slowly lower arms/elbows, taking 3-5 seconds to do so. To increase difficulty add weight holding a dumbbell or other household item in your hands.